I had the opportunity to see both the current Turner exhibition, ‘Late Turner, Painting Set Free’, and the current Turner film, ‘Mr Turner’, on the same day. It was a day of real Turner immersion, exhausting but worthwhile. Both the exhibition and the film focus on the later years of his life and whilst neither was designed with the other in mind they are remarkably complementary in revealing the both work and the enigmatic and private character behind the work. Turner lived from 1755 to 1851. 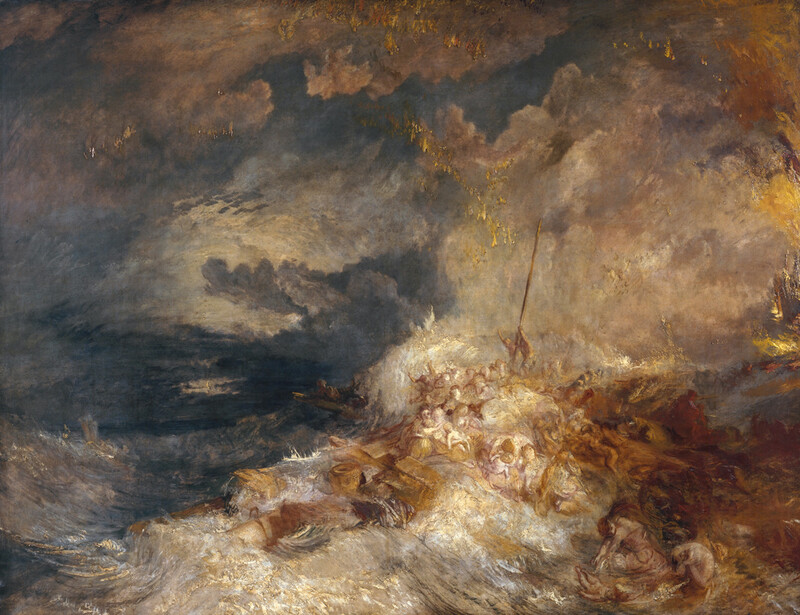 The exhibition at Tate Britain is a thorough review of Turner’s oil and watercolour paintings from 1835 when he turned 60 until his death at the age of 76. 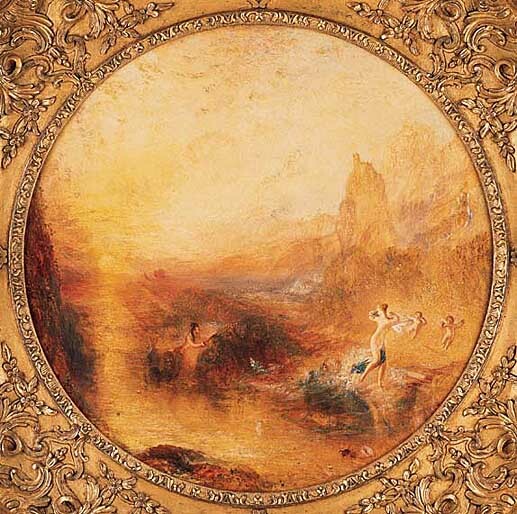 It draws heavily, of course, on Turner’s original bequest to the nation which is held at the Tate, but it also brings in pictures from elsewhere to bring home the scale of his output over those years. This has allowed them to show together paintings which were designed to be complementary but which are today only seen in isolation. For example his series of square and circular paintings which were all painted between 1740 and 1746 and which represent almost a separate exhibition within the exhibition. Peace, Burial at Sea and Glaucus and Scylla both form part of that sub-exhibition which forms one of the best rooms in the show. 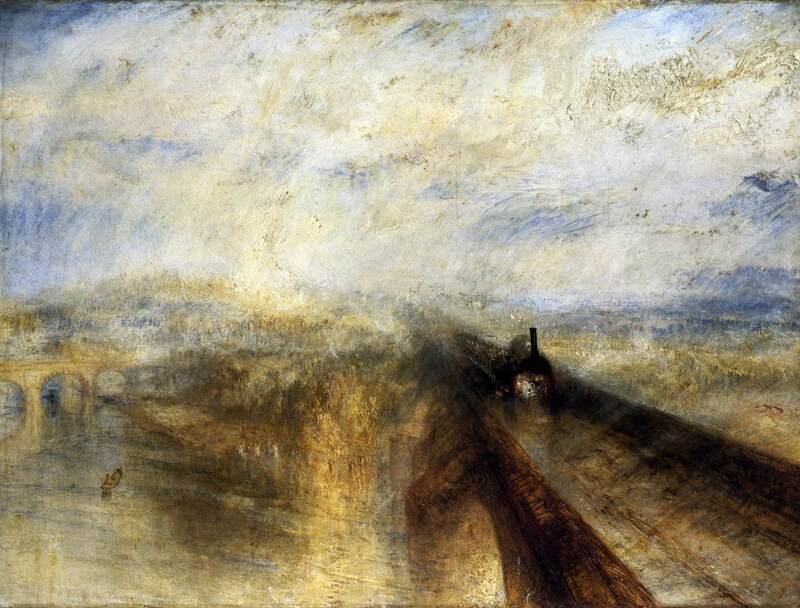 The core thesis of of the exhibition is that the tendency to view late Turner as a modern impressionist working before his time is too simplistic a reading of his work. He certainly did develop a painting style which was overwhelmingly focused on the effects of colour and light to create impressionistic rather than highly naturalistic results. And he certainly lost the support of many contemporary critics who became obsessed by what they could not see in his pictures – detail and narrative clarity – rather than what they could. But he was far from detached from the world in which lived. His pictures include some powerful comments on the passage of time, the rate of technology change and current events. At their best, the paintings manage to combine a uniquely creative sense of light and colour with a breathtaking sense of drama to create some heart-stopping images. I was moved particularly by Rain, Steam and Speed and Disaster at Sea.. But the reading of the exhibition is complicated by the inclusion of large number of paintings which may be unfinished or partially finished. It is evident that Turner’s strength was slipping in his later years and that he started works that he did not have time to finish. It is also clear that he frequently worked and reworked paintings over an extended period. As a result it is hard to understand whether some of his most impressionistic and loosest works of his later years represent all or only a small part of what he intended. To conclude that Turner is the first impressionist on the basis of unfinished work seems likely to lead to misunderstanding. The exhibition also includes large numbers of watercolours, some highly polished finished works like Bamborough Castle, and some essentially travel sketches. 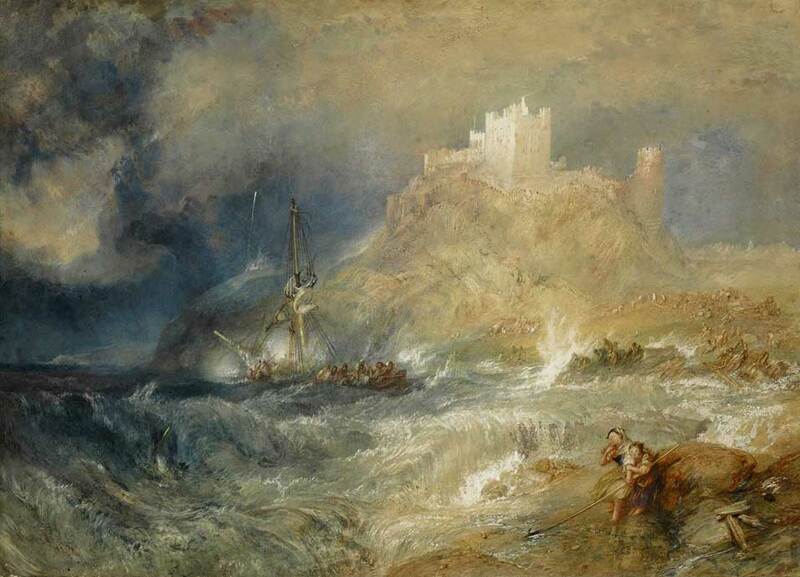 Bamborough Castle was never exhibited publicly in Turner’s lifetime but was rather shown privately at a meeting of the Graphic Society. It was apparently hailed as ‘one of the finest water-colour drawings in the world’. One of the things which the exhibition most forcibly confronts you with is Turner’s relentless travelling in Europe, always with notebook and portfolio in hand. Both exhibition and film reinforces the sense that being a great artist can be an obsessive and lonely occupation built on hard graft. Genius has to be worked at relentlessly; it does not leap from you fully formed. As Arnold Palmer famously put it when being accused of a lucky golf shot “The harder I practice, the luckier I get”. The exhibition is well worth a visit. It is crowded but on the day of my visit there was comfortably room to accommodate everyone and let you get close to works. The film, Mr Turner’ is a triumph. 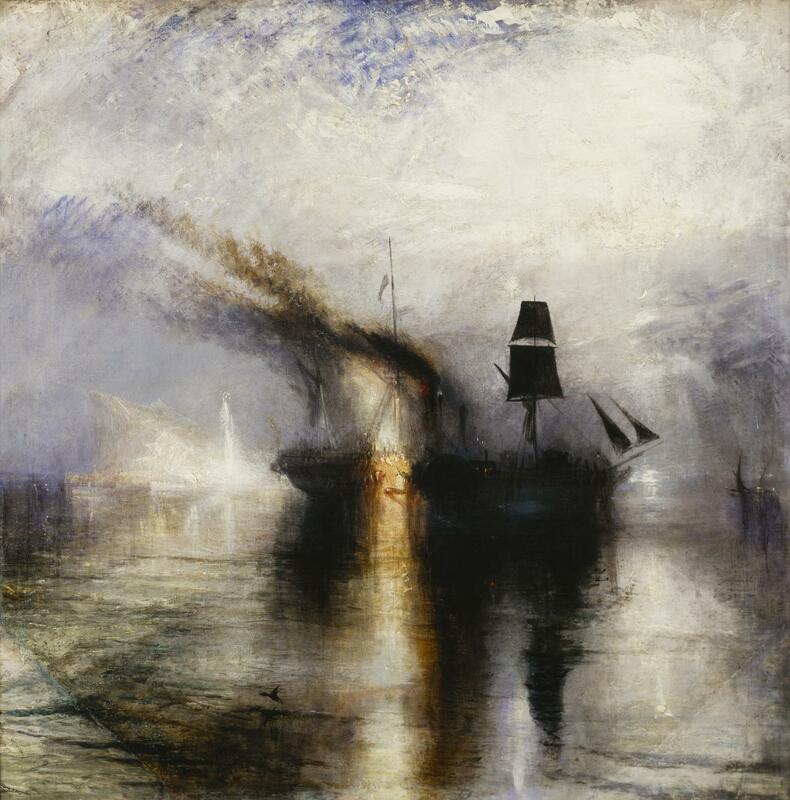 It is not a grand narrative, it is a character study built around a series of vignettes which illuminate Turner and some of his contemporaries. And all underpinned by the most superb cinematography which brings Turner’s palette to the screen. A scene in which Turner is rowed down the river to see the Temeraine being towed to the breaker’s yard against a setting sun is achingly beautiful. Timothy Spall’s portrayal of Turner is one of the most complete and compelling character studies I have ever seen, rendering an entirely plausible character. I do not know Turner’s story well enough to assess its accuracy but my sense is that it has satisfied even the most demanding observers. All in all, this is a film worth travelling to see, and worth seeing on the largest screen you can found. This is cinematography that demands an immersive experience. Posted in Art, Exhibition Reviews, Film and tagged Art, Late Turner, Painting Set Free, review, Turner. Bookmark the permalink.